CRM systems no longer surprise anyone: they have already been widely recognized everywhere — from travel agencies to installation companies. But somehow, some of the most important system features and functions still remain secret for the vast majority of its users. Let’s reveal them. “I had little doubt whether to introduce CRM: sales business requires my permanent presence to quickly find smart solutions to problems whenever they might arise. APRO CRM was recommended to me by a colleague of mine, who had an experience with it before”. What changes has APRO CRM brought? “First of all, I got the problem with clients database solved. Every customer is now registered in an individual profile, storing all the information about it — including written requests, calls, reminders, purchases, size of clothing and shoes, favorite brands, special preferences and other peculiarities. For instance, one of my clients suffers from backache, and I have always been striving to offer him special equipment that fits him best. Of course, this client was not the only one having some special preferences, and keeping them all in mind without any system or even connection was extremely challenging! Second, the marketing strategy of the company got literally jumpstarted by the CRM. To be honest, I didn’t always have the time to send promo messages to my clients, and even less often they were sent to all of them on the same day. Now, all my clients get weekly email and SMS campaigns about current offers, hot sales and new ideas about sports and traveling. Not so long ago, I decided to employ retargeting to attract some more mew clients. I also got my issues with reports easily solved. I’ve got the access to full and explicit statistics on daily sales and monthly income, as well as other key company parameters at any time. I can also check out reports about custom metrics: sales by stages, client’s willingness to buy, sales vs returns, etc. 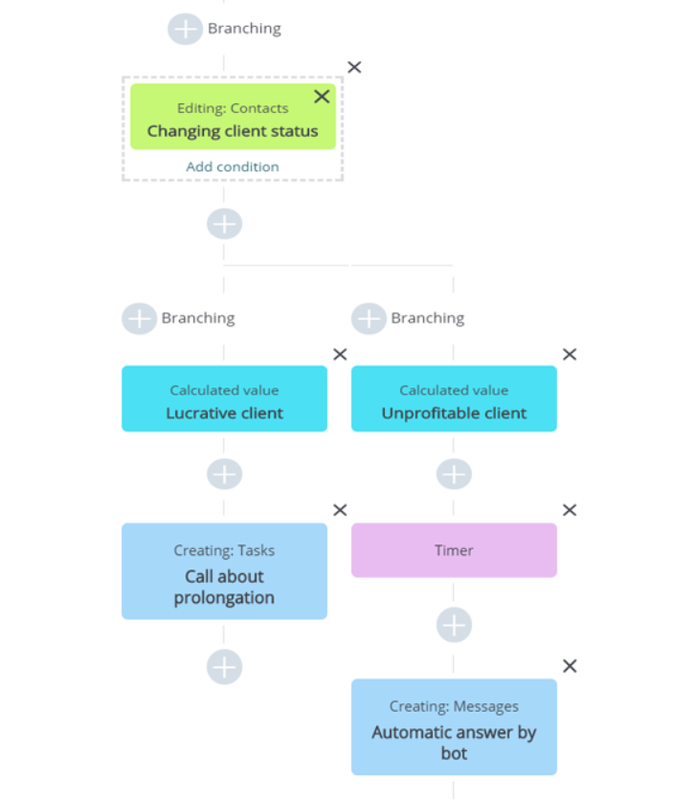 With APRO CRM, I finally got relieved about my finance: now I can generate invoices right from customer or deal profile with just one click, and fill out contracts and other documents just as easy. It took me a little bit of effort to create documents templates and adjust the fields in them, but the game was definitely worth the candle: now, APRO CRM takes care of all my company’s paper work — I only need to click “Create” and let all the information about customer and product (name, payment details, price, description, etc.) be filled in the document automatically. The overall business process in my shop became much smoother and efficient. There is no longer any need for me to stay at work all the time: everyone gets their tasks assigned in the beginning of the week and knows what they need to do. I can easily monitor the work load and the tasks progress, as well as staff attendance and working hours. All the issues and questions are discussed and solved in the internal online chat, available even from out of the office. Things are running smoother and easier. No one has to run across the corridor to ask a question or get clarifications. Of course, there are still occasional briefings and meetings, but in most cases, Intranet can solve any question. Not so long ago I decided to integrate my company’s website with APRO CRM through clients feedback forms and introduce live chat, call from the browser, and a callback option on the website. Another advantage I thoroughly enjoy is smart organizer, which totally eliminated any other sort of notes in my life. Reminders are no longer a problem for me. “The only thing I regret is the lack of time to explore everything APRO CRM has to offer”.